Market leaders in solar power systems across Western Australia, Queensland, New South Wales, Victoria and Adelaide. At Clean NRG we are proud to say that we are a Western Australian owned family Company, we provide a full design, sales, installation, after sales back up service and maintenance to suit the individual client's requirements. The Energy Stack™ Australia super-smart calculator works out the most efficient combination of energy companies and equipment for your home – saving you time and money. We tell you how much you could save, what to buy, who to go with and how to get it done – even if you don’t have spare cash lying around to invest in energy efficient equipment for your home. WE BELIEVE MANY AUSTRALIAN HOMES COULD BE SAVING UP TO $10,000 OVER 10 YEARS IN ENERGY COSTS. We built Energy Stack™ to put the power back in your hands. The Energy Stack™ Report explains how much you could save, what to buy, who to go with, and how to get it. Each report contains a detailed to-do list and we’ll make up to three recommendations for equipment with pricing, so you can go negotiate the best deal. We are a Solar Installation Service based in Perth, we can solve any solar related problem you may have and give you efficient and convinient energy saving solutions. 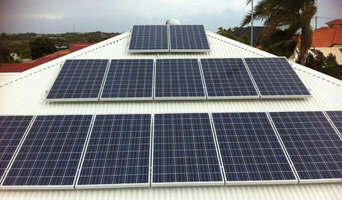 Sync energy is one of the leading company in Perth dealing with the installation of Solar Panel. We have the most experienced installers. Visit our website today for more information. Quality Residential, Commercial & Residential Solar Energy Solutions In Perth & Offgrid. Slash Your Power Bills With Solar WA Today. Clean NRG Solar is a leading solar company that offers the finest energy efficient commercial solar Perth solutions at competitive prices. Western Fusion Electrical Contractors are professionals. Our service, quality workmanship and guaranteed time lines provide our customers with five-star service which is guaranteed. Western Fusion's mission is to provide a reliable service and competitive quotes for all home, office and business projects. We pride ourselves on providing sound and informed advice, aiming to save our customers money on future power bills by offering the latest technologies available. The two main solar power systems are on-grid and off-grid. On-grid systems – also referred to as grid-tied and utility interactive – are connected to your mains power supply. If your East Perth, Western Australia home produces more energy than it uses, your meter goes down and you generate credits with your energy provider (check your state government for details on any rebates available). On-grid solar panel systems have lower equipment and installation costs, and will save you money through net metering. There are three main types of solar panels that can can generate electricity for your East Perth, Western Australia home: monocrystalline, polycrystalline and hybrid. The basic monocrystalline celled panels are fairly efficient and have outstanding performance in cooler conditions, but are marginally more expensive than polycrystalline, which works better in hotter conditions. Hybrid panels use crystalline cells with a thin layer of film, which attracts more energy. This makes hybrid models the most efficient solar panel installation, but also the most expensive. To talk about which solar panels are best for your home and how much energy they produce, contact an East Perth, Western Australia solar panel company or installer on Houzz. Find a solar power contractor on Houzz. Search the Professionals section for East Perth, Western Australia solar power contractors or browse East Perth, Western Australia Photos of completed installations and then contact the professional responsible. Here are some related professionals and vendors to complement the work of solar power contractors: Lighting, Pools & Spas, Electricians.